Val Gardena is in one of the most beautiful Italian ski regions of the Dolomites, and Hotel Adler is the best hotel in the historic village of Ortisei. Whether you are traveling with family, or just as a couple, this 5-star 1810 hotel in south Tyrol is lovely and luxury. Hotel Adler is a bright yellow castle perched in the center of the authentic ski village – decorated with grace and grandeur yet modern spa and services. Families will love the Water World of indoor and outdoor pools at the Hotel Adler, and the proximity to Ortisei’s pedestrian shopping zone. For adults only, the next door Adler Balance is a modern wellness and spa hotel with a serene vibe, some clientele stay in fluffy robes (provided) all day. Adler Balance’s spacious modern suites are very alpine chic with deep jacuzzi bath and huge balconies looking out at the mountains, gondola and village. 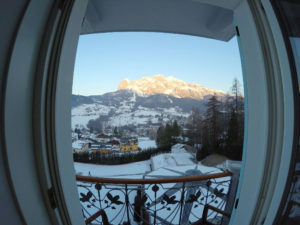 From the Hotel Adler, a 7th generation family-run hotel, you are an easy walk to the ski lifts of Val Gardena/Groden and Alpe Di Siusi/Seiser Alm. 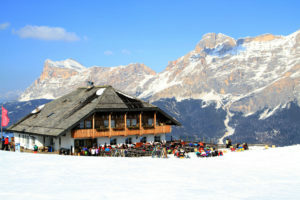 San Lorenzo Mountain Lodge is the ultimate exclusive private ski chalet in the Dolomites of Italy. This 16th century hunting lodge has been transformed to the most luxurious private ski chalet imaginable. From the helipad to the high elevation putting green, the private wine cellar, to the outdoor spa overlooking the valley and the dramatic peaks, this place, the White Deer, will make you feel like ski royalty. Princes may have stayed here, its that posh and private, since you rent out the entire lodge with four bedrooms, a lavish spa, and private chef. Your gracious host, proprietor Stefano Barbini is on hand to make you feel at home in this haute retreat, even hire a private instructor for skiing the nearby ski slopes of Kronplatz. It’s pricey, but can you put a price tag on no paparazzi, just palatial lodging in the Italian Alps? 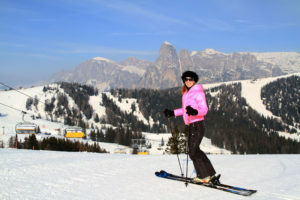 Skiing nearby at Kronplatz, Plose, Gitschberg Jochtal, Val Gardena and the rest of the Dolomiti Superski Region. 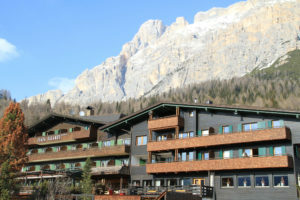 Hotel Ciasa Salares in San Cassiano is the best ski hotel by the slopes of Alta Badia, in the center of the Dolomite ski region and near the Sellaronda tour. This charming chalet style hotel resembles an elegant Austrian mountain lodge with polished service and award-winning Italian food and wine. Run by the 4th generation of the Weiser family, Ciasa Salares is casual and warm, with a wine bar and comfy living rooms, but the Michelin 1 star La Siriola restaurant is outstanding – among the best dining in the Dolomites. Rooms and suites here are modern alpine chic, rich with native wood and stone, classic down duvets, and spa like bathrooms. There’s a full Spa with large pool, Turkish bath, jacuzzi and Sauna, massage and beauty treatments available as well. Ciasa Salares is family friendly and allows pets, and skiers. There is even a shuttle to the slopes at Alta Badia if the walk to the lift across the street is too much. Hotel La Perla in the pretty ski village of Corvara, within the Dolomite ski region, is a gorgeous five-star hotel, ski in ski out, with lively après ski, traditional service, and fine dining. The Hotel is gracious and grand with a beautiful lobby bar, and Michelin 1-star dining at Stüa di Michil. On the flip side, the most happening après ski bar in this Dolomite ski region is Murin in its own rustic Chalet on property of La Perla. Since you can ski right to it – its one of the best après ski bars in the Italian Alps, in league with Austria’s Moosewirt at St Anton. You can tour the Wine Cellar, an animated shrine to wine, with 26,000 bottles that dance (its silly) in the caves of the Hotel. Hotel de La Poste in Cortina is historic, dating to 1835, this is where Ernest Hemingway stayed in the 1940’s. In the heart of Cortina’s pedestrian village, this classic hotel is home to the famous American Bar, Cortina’s original post office, where you can sip Bellini and watch the stylish people stroll by after skiing. Rooms at Hotel de La Poste are traditional for this 5th generation hotel. 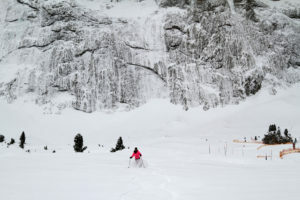 You are a short walk with your skis to the tram at Faloria and a shuttle to Cortina’s other ski slopes, and the rest of the Dolomite ski region – over 1,2000 kilometers of skiing. Hotel Gardena Grodnerhof in Val Gardena is a five star Relais and Chateau hotel on the River in Ortisei in the valley of Val Gardena. This luxurious sk I hotels offers a mix of alpine tradition and modern hospitality. The rooms have been renovated in alpine elegance, and the lobby bar is very chic, while the dining at Anna Stuben is classic Michelin 1-star in a classic Tyrolean Stube environment. 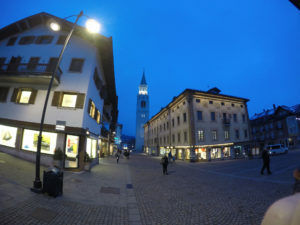 You can walk to the village of Ortisei and the pedestrian shopping and cafes, or to the ski slopes of Val Gardena and Sieser Alm, all part of the Dolomite Superski region pass.